Разрезка возможна: по времени, размеру, на равные части или по сценам. Можно менять практически все выходные параметры видеофайла, - бикубический и билинейный ресайз изображения, даже возможность вставки 25-го кадра. Работает со следующими форматами медиа-файлов: - AVI (DivX, XVid и др. ), Mpeg (*.mpg, *.mpeg) (VCD, SVCD), DVD (*.vob, *.ifo), WMV (*.wmv, *.wma, *.asf), QuickTime (*.mov, *.move, *.qt), Mpeg 4 (*.mp4), RealMedia (*.rm), Flash Video (*.flv) и SWF (*.swf), JPEG, GIF, PNG, BMP, TIFF, Mp3, WAVE, анимированные GIF, Mpeg Audio Layer-3 (*.mp3). Имеет режим командной строки, свой проигрыватель и встроенный FTP клиент. Multifunctional application for processing tons of video files by one click. The program possesses a wide range of capabilities, which enables to perform any operations with bulk of video files by one click! 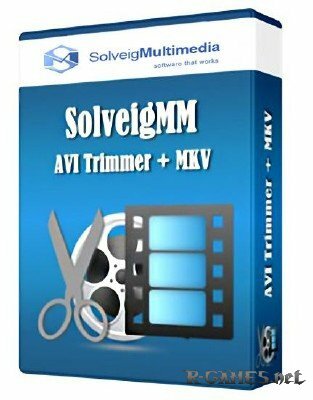 It can be used to split audio and video files into smaller parts, join a few media files into a single one, extract or delete scenes, create thumbnails for video files, add watermarks to video and image files, process sequences of images. VideoCharge enables to process videos on flow (without decompression and successive compression of every frame), supports working via command line, inludes built-in FTP client. It is optimized for processing vast amount of files and supports all basic video and image formats. * AVI - Audio Video Interleave (*.avi). 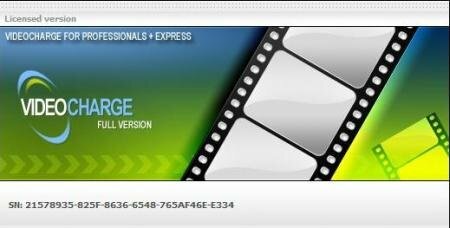 Enables to work with any video codecs installed, decode DivX and XVid files. * MPEG - Moving Picture Experts Group (*.mpg, *.mpeg). Supports decoding and encoding files into MPEG-1, MPEG-2 (VCD, SVCD) formats. Enables to convert MPEG Transport Stream files (*.ts) into any supported format. * DVD - Digital Video Disk (*.vob, *.ifo). Can handle DVDs. Enables to preview and decode .vob files singly or together, using data derived from .ifo files. * ASF, WMV, WMA - Advanced Streaming Format, Windows Media Video, Windows Media Audio (*.wmv, *.wma, *.asf). Supports processing of files of Windows Media 7/8/9 formats. * MOV - QuickTime Video/Audio (*.mov, *.move, *.qt, *.3gp) *. Provides ability to playback (decode) and create MOV files. * MPEG-4 (*.mp4) *. Provides ability to playback (decode) and create MPEG-4 files. * 3GP (*.3gp) *. Provides ability to playback (decode) and create 3GP files. * RM - RealMedia (*.rm) *. Allows to convert RealMedia files into any supported format. * FLV and SWF - Flash Video (*.flv) and Small Web Format (*.swf) *. Enables to playback (decode) and create FLV and SWF files. * Wave - Wave (*.wav). Provides ability to work with RIFF audio data. Enables to create WAV files and convert them into other formats, for example, MP3. * Graphic formats: BMP, GIF, PNG, TIFF, JPEG. 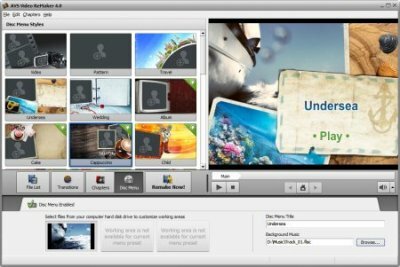 Provides ability to save video frames into separate graphics files and vice versa, join sequences of images into video clips. * MP3 - Mpeg Audio Layer-3 (*.mp3). Is able to create MP3 files of video and audio files of all supported formats.